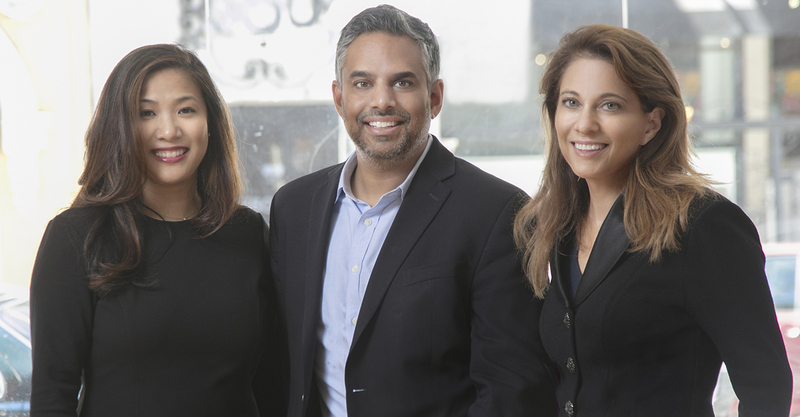 Photo of Christy Nguyen, Sameer Khedekar and Julie Pearl provided by the firm. Ever since Lawdragon first began researching our guide to the Most Powerful Employment Lawyers back in 2008, one name has consistently come up as among the most admired of immigration specialists – Julie Pearl of the Pearl Law Group in San Francisco. A former Deputy Attorney General in California, Pearl has been a leader in handling the immigration needs of employers and individuals since founding her firm in 1995. She also has been a pioneer in the field by developing software and products that streamline the delivery of services to clients. Pearl’s success has also come from building a talented and diverse team of attorneys with a wide range of life experiences. Among them are Sameer Khedekar, the firm’s managing partner, who was a green card holder into adulthood, and Christy Nguyen, a partner whose family first came to the U.S. as political refugees. Needless to say, the firm’s already busy workload was intensified with the election of President Donald Trump and his immigration policies. Lawdragon: For those not familiar with Pearl Law Group, can you summarize the range of services the firm provides, and to what type of clients? Julie Pearl: We secure immigration status for talent wherever it needs to be in the world, with offices in the Americas, Asia Pacific and EMEA [Europe, the Middle East and Africa]. Our corporate clients range from startups to Fortune 500. We also work extensively with entrepreneurs, investors and “extraordinary ability aliens” – that’s the official term! LD: Julie, what led you to start a firm in this practice area? Was this something you had always considered or did your tenure as a Deputy AG trigger the decision? JP: As an undergrad student at Stanford and a dual national of the U.S. and Canada, I was able to live in the International House where I met people from all over the world. Learning about the immigration challenges these incredibly smart people would face should they decide to build their careers in the U.S. left an indelible mark, and I vowed to dedicate myself to their cause. Like my grandparents, who were all immigrants, these people are at least twice as likely as those born in-country to start enterprises and to make significant contributions to every field. Who wouldn’t want to spend their working days with such greatness? LD: What were some of the challenges in the early phase of the firm? Did it take awhile to get on solid footing? JP: Just the usual stuff about learning how to run a business, especially since few law firms provided a positive role model of culture, efficiency and other essential parts of a healthy ecosystem. Mentors abound in Silicon Valley, and several of them carried us through it. LD: Sameer and Christy, can you share why you decided to go to law school and specifically why you were interested in immigration law? Christy Nguyen: My initial interests in going to law school took root from the fact that I am a first-generation immigrant from Vietnam, and having grown up as a minority, I quickly identified with the plight of all minorities when I learned about the civil rights movement through my undergraduate history courses. Another seminal moment during my collegiate experience occurred when Fred Korematsu, a Japanese American civil rights activist, visited the University of California, Berkeley, campus and spoke about his own personal experiences during WWII and the internment of Japanese Americans. While I am passionate about constitutional law, I felt that my upbringing as an immigrant, coupled with my interest in civil rights, eventually led me to practice immigration law. Sameer Khedekar: I saw law school as a means to understand the system of rules that govern how we all are allowed to operate, and then use that information to help people optimize their lives. My mom actually went back to India to have me, and as a result I had a green card into my adulthood. I’ve therefore endured my own immigration-related challenges and wanted to help others navigate bureaucratic and confusing processes and obtain a feeling of fundamental security and permanence in this country. LD: Can you also share why it turned out to be a good fit — what is rewarding about immigration work? CN: In my estimation, the greatest reward is knowing that I have made a positive difference in people’s lives by giving them an opportunity at achieving the American Dream for themselves. While my mother certainly wanted me to become a physician like my father, I, on the other hand, had other ideas. I might not be a doctor, but I can help bring doctors to the United States to cure cancer! SK: This field has been a win-win-win for me. I feel rewarded by helping companies achieve their business objectives by hiring the right people; helping our country by bringing the best and brightest to work regardless of nationality; and helping individuals find their way and settle in a new country. LD: Julie, what type of firm did you set out to create in terms of culture – what is Pearl Law Group like as a place to work, and what traits do you look for in young attorneys who may join the firm? JP: We always understood that the people we hire represent 99.8% of our success, given the right tools and support and training. So we looked for strong intellect and character, proactive and dedicated performers with a strong team ethic. LD: Sameer and Christy, what do you look for in younger lawyers? And what you think it takes to succeed in this practice – how did you reach your level of excellence? CN: It is critical for young attorneys to bring passion and empathy to the field of immigration law. We, at Pearl Law Group, look for attorneys who work hard, are highly organized and are team players. SK: It’s also essential to have the drive to learn on your own. Immigration is complicated and requires a large amount of practical exposure and aspiring practitioners need to seek out this experience. We also look for naturally empathetic people who want to help others because they know what the experience can be like. LD: Can you also describe how and why you came to the Pearl Law Group. What do you think makes the firm unique? CN: When I was considering joining the team at Pearl Law Group, the word on the street was that it was extremely hard to “get in” and that there were so many “smart people in the firm.” That made me feel more than a little intimidated. When I was hired, I was ecstatic because everyone in the firm was warm, welcoming – and yes, smart – and certainly not at all what you would expect from a typical law firm. I believe we have kept that positive reputation over the years. SK: Our firm has a perfect blend of sophistication, genuineness and warmth. We have smart lawyers, strong partnerships with great clients, an innovative work environment, and best of all, really nice people. LD: What impact has the new administration and some of its intended policies had on your practice and client service? Perhaps each of you can focus on something specific as it relates to your practice. CN: To say it has been challenging in the field of immigration law since the election of Donald Trump is a vast understatement. Policies have been changing so dramatically that our clients – employers and employees alike – are tremendously anxious and confused. It is our job to decipher the policies and executive orders from the administration, then analyze the potential impact of said policies, and finally inform and guide our clients as expeditiously as possible. In all seriousness, we have become part lawyer, part therapist. SK: Recent developments have caused us to “play defense” more so than ever before. We are spending more time advising on compliance-related concerns, and have had to work hard on ensuring that our clients understand the true meaning of the litany of changes that are happening, like the travel ban, which freaked out many people. It’s our job to calm them down, and it’s fulfilling to see that people feel better after speaking with us. JP: We’ve upped our communications substantially by issuing alerts within just a few hours, if not immediately, when actions are taken by the administration and when imminent actions have been leaked. Besides our usual email distribution, we’ve more fully embraced social media for communications. We’ve created a special section on our public website for monitoring developments and accessing important resources. Our primary audience in the past has been human resources and global mobility professionals at our client companies. We now need to reach a much broader community, including foreign national employees not necessarily being sponsored for immigration benefits, as well as their extended family members. In addition to increased communications, we’ve amped our pro bono activities, including volunteering at the airport for free legal services, taking additional pro bono cases and designing a free Artificial Intelligence-based tool (www.visabot.co) to help “Dreamers” file applications under President Obama’s Deferred Action for Childhood Arrivals (DACA) order. Finally, we’ve been helping companies consider and implement new policies to help protect data on company-issued devices (smartphones, laptops, etc.) and advising individuals on how to best prepare for increased scrutiny during immigration inspections. LD: Julie, as someone who’s had success as an entrepreneur, are there new strategies, technologies or business models you see as emerging from some of the uncertainty that has accompanied the Trump Administration? JP: More than ever, it’s now essential for C-suite executives to pay attention to immigration developments and understand the impact on their employees and their business. They should be relying on in-house professionals and outside counsel to spot the issues and support internal communications. A natural response to the uncertainties and anti-immigrant sentiment in the U.S. is also prompting many companies to look at operations in countries with more favorable immigration policies for top talent. For example, it’s been widely reported that American companies are exploring alternatives in Canada for their foreign national employees. LD: Staying with that, Julie, can you describe your motivation for starting ventures like Tracker Corp and Pearl Travel Tech? And how much of your time is spent on those companies? JP: Innovation is key to remaining competitive in this field, and technology helps us automate the more routine aspects of our work, and facilitate efficient communication. Failure to keep track of critical deadlines, expiration dates and other milestone activities can have devastating results for clients, so as my practice grew, I knew I needed a technological solution. Since there wasn’t anything available on the market, I got the job done! The Tracker immigration case management system is now a leading product used by scores of companies, other law firms, and universities. Similarly, we started Pearl Travel Tech to address the unmet needs of employers with very large populations of international business travelers, to assess the immigration and tax aspects of their trips and avoid the potential for significant financial and reputation risks. LD: Did any of you have a mentor you can identify as having a particularly important impact on your career? CN: My high school English teacher immediately comes to mind, as he taught me how to write clearly, but succinctly. Communication is essential in our field, and it is especially important for us to present written information that is spot on, yet easily digestible by those for whom English is often not their first language. SK: Julie (Pearl) has been my most significant mentor, like a Big Sister. She teaches us all how to go the extra mile for our clients, and to never ever give up! My first boss also ingrained in me the importance of never taking no for an answer when your client’s life in this country basically is at stake. LD: Is there a client or experience that stands out as particularly memorable or representative of why you love this work? SK: When I first came to the firm 11 years ago, an employee of one of our corporate clients was in the process of getting his green card. Sadly, because of a terrible accident, there were a lot of challenges and delays in his immigration case. We supported him for many years, and he finally got his green card. I was glad to have had the opportunity to travel across the country to be with him at his green card interview and see the case to the end! CN: I have enjoyed working with companies that have grown from a handful of employees, with only a couple foreign nationals, to large organizations with hundreds of foreign nationals. It is also fascinating to witness the lifecycle of companies – i.e., from growth to slow down, layoffs and then regeneration – and then advise foreign nationals through the challenges they have faced in obtaining their green cards through these companies. This process can go on for years and we get to know our clients extremely well! SK: I also get tremendous satisfaction from the fact that we have our employees who’ve been with our firm for many years and continue to talk about how happy they are here. It makes me happy to know that they’re happy. LD: How do you expect immigration law to change in the longer term? What’s a broader trend you see that is not tied to changes in the administration? SK: We’re seeing more emphasis on efficiency and automation, to help drive down cost. But we’re very careful to keep the personal aspect of our service. I think we’ll also continue to see a trend in more global immigration, as regulations in the U.S. become more restrictive and opportunities increase in other countries. CN: There has been a substantial increase in government compliance audits and a marked vetting of visa applications abroad.This is not just in the United States, but elsewhere, and it will likely continue for some time. LD: What do you all do to have fun and relax away from the office? CN: I love to spend time with family and friends. Traveling is a high priority for me. Paris has been and will continue to be my favorite destination! SK: When I’m not with my kids and my wife, you’ll find me on the golf course or binge-watching an amazing TV show. JP: Family time, running, most events involving food.